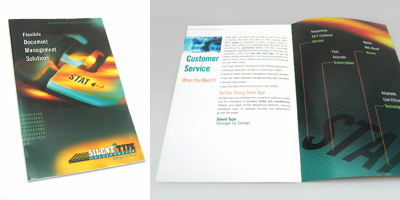 Role > Helped develop designs for Brochure and successive advertisements. Completed all high end renderings of low resolution comps. Performed all pre-press and pre-flight production. Objective > Silent Type is a leading provider of efficient, accurate medical transcription. This brochure is a sales tool, describing the sophisticated system which helps the medical community transcribe their records. Results > The solution was a half-size multi-page brochure which picks up the identity of Silent Type and expounds upon how they provide the end user with the latest in technological solutions for their document management needs.